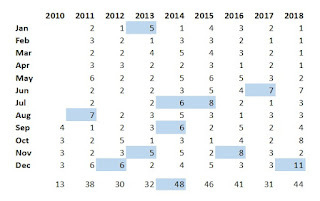 Back in September, we looked at an old chart that showed posts by month by year and brought it up to date (see post, Review and news). At the time, we were reviewing posts in order to present an index from our web site: TGSoc.org. This is our last post of the year. With 2018 coming to a close, we can update the table through December. 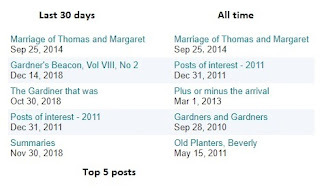 We started the blog in 2010 and did not count the month with the greatest number of posts for that year. In the "Review and news" post, for each month, we looked at what was going on as that is a huge factor in the number of posts.We will be looking at that further. So, this month, we had the largest number of posts at 11. The highest before then was 8 posts which happened in two months: July of 2015 and November of 2016. In July of 2015, we were first looking at The Massachusetts Magazine. Subsequently, we went through every issue and its articles, did several posts on articles in the TMM, wrote articles for The Gardner Annals which were printed, and captured the Table of Contents. In November of 2017, we were writing the first article for Volume III of The Gardner Annals where we looked at contributors plus provide the TOC for the first five volumes of the TMM. We will continue to use the blog to report on research as well as to keep track of current items as we go through our work. The blog has proven itself, and uses of the tool are found everywhere. The 11 posts for December show some of the range that has been covered by Gardner Research. The theme of 400 has been constant for a few years, covered in many posts. Some of these posts are mentioned below, in no particular order. Each will be revisited for updates. An example would be Plymouth's plans (both sides of the pond). We can use that as a something to watch and learn from. Our first mention of 400 years (we have a page listing various 400th celebrations - from 2013) was in 2011 while musing about Thomas as an example of the backbone of the country. The thinking still applies but can be improved with the new insights gained since then (a boatload - after all, I was still a newbie in 2011). By 2013, we were thinking about specifics: 400 anniversaries. We had read of events in Salem a 100 years ago, in which the family participated: Dr. Frank, Ann's grandfather, others. Unfortunately, by this time, Dr. Frank's The Massachusetts Magazine had hit the dust. We will have much more on that. We all remember Jamestown's shindig (2007). The Popham Colony of Maine would have been celebrated, too. Naturally, we had to mention that Kansas had a 400th back in the mid-1900s, celebrating the Spanish explorers who were looking for El Dorado (now a town). So, by generation (using an average of 25 years) count, we would have sixteen. I looked at one line that consists of fifteen generations. Of what? The American experience which we will have as a topic next year. One of our topics, too, will be Historical Puzzles of which there seems to be no end. A very important one will be addressed, initially, in January of 2019 (please, stay tuned). But, we would be remiss without mentioning the Final Migration. Yes, just as we look at the arrival by water, we can look at the western migration. Those early attempts will be in focus, as movement away from the coast happened almost immediately both in Massachusetts and Virginia. Of course, the 'final migration' was after the Revolution. So, that theme will continue (Dr. Frank's TMM had an article on this conflict every issue for a decade quarterly), too. And, Gardner is found everywhere. In Kansas, where the Sante Fe and Oregon (California) trails split was at Gardner, KS. The Oregon wagons went just south of Mount Oread, home of the University of Kansas (founded, of course, by New Englanders as was the town of Lawrence). One can think of the students seeing the itinerants go by (actually, stopping there at a major camp site). But, we find that all locales, 100 years ago, got interested in their history. That has been constant. This book was written by a Chapter of D.A.R. : Illustrated History of Early Wichita. BTW, the long reach of New England is part of our research interest: Col. Higginson, Lyceum, Judge Thompson, and more. We even carry it down to New Zealand and other places. Of course, the overall theme is culture/history/technology which will be further discussed as the overarching concept for carrying research into the future. In that will be people, leading to genealogy. Of late, we have rediscovered WikiTree (original look, 2014). It was used to settle, somewhat, the wives issue (Margaret anew). We also have used it to expand Dr. Frank's tree using his hand-written notes for his mother's line. Turns out that he is descendant from both wives of Thomas. Lots to do. And, we can keep it fun. Inconsistencies can be tolerated, many times. Actually, the need for that might be a motivation for using fuzzy techniques such as those worked by Lotfi Zadeh. That is, what some might call ambiguity might just be a normal situation when strict numeric comparison can be a problem. So, we say our height in feet and inches (in some places on the planet) rather than some precise measurement using another scale. It is nice that medical milieus post weight in kilograms rather than pounds. People might think that they are lighter than they actually are. So, a fuzzy height can be as good as needed, unless one is trying to squeeze a semi with trailer under a bridge with a strict constraint. Ralph might have used 'foolish consistency' at one time, however we have seen enough damage from drivers ignoring warnings, in western, isolated situations. Too, in the modern world with interchangeable parts, who cares about which nameless parts was involved. But, we do, in serious accidents where history of fabrication might come into play. That just might be more of concern in the future when the reality of contracting out through levels becomes even more prevalent. Or, trying to track farm goods that might be causing problems. Generally, referencing some class involved with an object is sufficient, for starters. We, somewhat, default to that. Look at the success of the abstracted view of news that USA Today pioneered (well remember getting a copy of the initial printing). In historical accounts, there may, and ought to be, various views. Which is taken to the top? There is a saying related to the winners writing the history. So, Gardner Research has seen several puzzles. One will be written about next month in detail, that is, as much as we can surmise at the moment. However, another one is intriguing since it involves western settlement bridges the whole of the country of the U.S. The post, The Gardiner that was (October 2018), relates to trying to resolve several puzzles. An interim report gave some of the details about a ship that wrecked and the owner, however several facts were overlooked since they seemed to be out of scope. However, do this work opened the door to naval commerce, and that is directly related to areas of concern for Gardner Research. Too, it affords the opportunity to learn more about this aspect of our collective past. For one, it is astounding to read of the numbers of sailors lost whither for one town or for an area. We are talking a huge number, especially for whalers, which we mean to get back to. Now, reducing this post to only one puzzle, we'll leave the others on the stack. Who was the pilot of the ship when it wrecked? There are, at least, three names that have been reported. Thomas Coffin - This was told by some who were on the ship that first came upon the wreck. Too, the individual stayed in the area and helped settle the city of Gardiner. Now this is the official view, evidently, due to the various web sites that quote the name. ___ Boyling - This came from the captain (not a passenger) of the ship that came upon the wreck. The Captain reported what he knew when he returned to San Francisco a little later. The publication, Naval Journal, reports __ Boyling, too, following the Kate Heath? George Snelling - a supposed relation to the owner of the ship. We know a little more about him. He was on the Kate Heath when it went back to San Francisco. Too, he was post master in Gardiner for a while. There is some correspondence with him and a local leader. But, where was Snelling when these letters were interchanged? Back east. He got married. In fact, the local leader mentioned this, yet the writings seem to describe Snelling as a long-time resident of Oregon. Are these trivial issues? Not really. It is of interest in that we had our first real social media in the naval environment. Ships signaled each other. Or, the crews chatted if they were in the same area. Then, ships reported what they saw when they got to a port that could take reports. If we looked across these reports, we could map out things just like we can in virtual space. So, we know that the barque Bostonian that wrecked had been in New Zealand a little before it wrecked. It reported who it saw, and these sightings were confirmed by Gardner Research. However, on the reports at various places, the usual method of naming the Captain of the ship was not always followed. The New Zealand mention of the Bostonian does not mention the pilot. But, there is more that we can look at, given time. Also, it turned out that the wives of the owner of the ship were Thomas Gardner descendants. Too, we found out that there are some errors in the Barney database for Nantucket. Along with fuzzy determinations, one must consider how much effort ought to be devoted to correcting errors. Say, the newspapers put their misprint notices in small print on some interior page. But, we're dealing with more than just ink on the page. The family of the owner of the ship contacted us. They had their own questions. So, the NEHGS is right on; one cannot do genealogy without looking at history. And, fleshing out the characters at events of history can sure tell us a lot. 12/30/2018 -- The discussion will have to consider viewpoints. As perspective is not the monolith as thought and brought forward by groups and their group think. However, with the communication delays, one can hope that a timeline would help get things straight. That is, this 1851 report mentions Bowling as conveyed by the Captain of the Kate Heath which was the first to come to the site of the wreck. As mentioned, we missed this last year. So, we are a couple of days early. 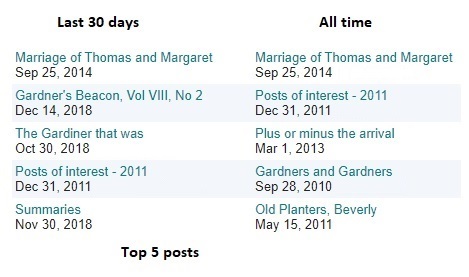 It is interesting to see that the "Marriage of Thomas and Margaret" post is on top for the past month and for all time. We have mentioned this theme before in several posts, such as Operations and actions. Culture comes first due to the people focus that is being demonstrated, suggesting, of course. a type of teleological framework. People and culture go together. History is several things, but there is what happened and what is written about. We all know that Thomas and Margaret were; not much was written of the couple at the time. We have no examples of pen on ink from Thomas. So, we can think, almost, tabla raza. One might say that we will see more instances of people-oriented history through time, mostly due to technology. Which we take for granted? How many even wonder about the moment-to-moment miracles related to a mobile mobile-device moving through space-time, yet continuing its connection to the cloud (generic usage) with minimal disruption? If you complain of outages, etc., then, I would suggest looking into the technical details of what is going on. In many instances, we have problems arise that really have no solution besides some type of kludge, say moving to another area that might have less interference. We could discuss this all day. Similarly, we have science projects running wild with computation and finding that their results cannot be reproduced in another setting, either immediately, or after some period of time. And, until lately, this was not even on the table for discussion. That is, computational resources, et al, will be very much part of any experimental scheme's explicit list (perhaps, even with experts whose job it is to resolve associated problems). Beyond our scope? Not really. Of late, I have been toying with WikiTree due to several reasons. Yet, I am trying, at the same time, to keep the future in focus while dealing with the minutia of this type of computing. WikiTree will not even let someone come into the Great Migration Project area with their transition file (Gedcom, whatever). We see bad stuff out of ancestry all of the time. But, that's more of a management issue. One technical issue deals with the underlying issues, which usually can be thought of as hardware and software, but is actually more nuanced. And, in hardware, it's interesting to see the changes over the past couple of decades. One of late was the need to adapt to the presentation approach of the 'smart' phone. That is, the old browser-oriented mode (starting in the time of Mosaic) was getting to be too onerous for the flexible way that was possible. Too, though, some went too far with SQL (and equivalent) where one had no idea of structure. A balance seems to have emerged. As we left OfficeLive, I looked at a bunch of alternatives that were available at the time (2012). Did not like their ways. Then, while doing the mobile-friendly look, I considered a slew, many top-of-the-line. Again, you give up too much. Of course, WordPress is nice. Perhaps, we'll run it on our own server (virtual). We'll see. We have already tried several means for discussion, etc. Right now, FB is being used, somewhat. There has to be some means for research and commerce. The latest AARP warns the old folks that many who are offering web services are not to be trusted. You know, when they started to monkey with browsers, it opened up the door for others to take advantage of the innocent. We all know the stories. Mostly, they seem to go into one ear and out the other. Not for the Thomas Gardner Society, Inc. We'll have safety and security high on our priority list as we proceed. As said before, anyone who wants to get hands-on experience, in the Linux environment, we have more than enough work to be done. Is it possible to have roll-your-own in the future? Given how much trust been lost, I would say, why not? I'll have a post that pulls together all of the posts related to this theme and an important aspect: content versus configuration. These are really two of many hats that have to be worn. Any major organization has these covered by a team of people. 12/26/2018 -- For a long while, I pointed to this page as my favorite on the web: This Week’s Finds in Mathematical Physics. Later, it was changed to “This week’s finds.” But, for years, it was basically textual with graphs presented thus, with some graphics added in. Look at Week 118 (March 14, 1998). It was not until later in the aughts, that we saw serious changes. Here is an example from 2011 (a transition year). The old posts are there; a timeline shows post numbers by year. Now, we have a new look: Azimuth. It’s interesting that the two current posts are on geometric quantization. And, the blog is using modern markup approaches. Oh yes, another example of the power of WordPress. Still, I hope that the old posts stay around for comparative purposes. While reviewing former posts, in the reorg effort, a post from 2011 on John Tylly got me looking at what became of him. That led to a reread of material on Cape Ann as this was the original demarcation point. Below is the beginning of a list of books in order of publication. However, there have been articles by Mary Ellen Lepionka that caught my attention. For instance, from February of this year: The Settlement of Cape Ann: What is the Real Story? It provides a broader scope that we can learn from. 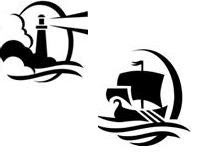 The Colonial Dames have a Cape Ann Chapter that is based in California. We will continue our research on John Tylly, as one who needs to be remembered. Plus or minus, of course (note: one of the popular posts over time). We need to get back to fuzzy. The strict numerics of the computer abetted by applied mathematics is killing us. I use '15' based upon one case that I documented, as it is associated with latest leaf on a particular tree. Others can have their numbers (only popular with one particular crowd). On Quora, I saw a post by someone with a credential of "Eleven generations of the American Dream" (paraphrase, as it caught my mind and grabbed hold, for good reason). Yes, indeed. That is what I have been writing about. Except? The American dream? No, it's not Harvard's view or any of the others that have been proposed. No, let's discuss this thing. But wait. We have to lay down some necessary groundwork that has been ignored by most. We'll do it slowly, too. Come along for the ride, as we have a relook at the American experience, once again. Lately, an index of images has been presented on both portals (TGSoc.org). This maps back to the blog and is not dissimilar to the ones on the right which shows posts by relative views. 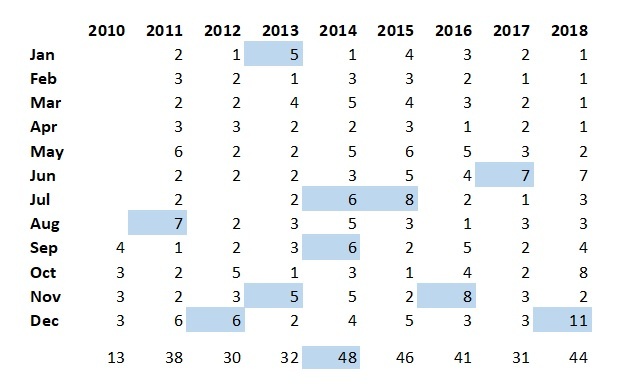 Our index covers all years and pulls things of interest. To whom one might ask? One applying a curator's view. Of course, there are several of these, so the thing might be thought of as a group of curators. After all, posts generally were related to things going on at the time that map to the early days. Or, they were motivated by events such as being addressed by Recent finds (btw, note, too, the Page map). So, many of these are markings of our education as we have dived in and read over the past decade. Trying to catch up the hundred years since Dr. Frank. There will be more images squeezed, over time, into the index. However, let's start a categorical index. And, ought not it be based upon the whole of the timeline associated with the 'fifteen generations' of experience that, in part, has to do with the unfoldment of the American dream (or fantasy, take your pick)? We can start the arrival, with something on the 'before the arrival' (Cape Ann Retrospective) period. Or, we can look at the various houses (Sarah Balch). Earlier, John's working with the crew that mapped the Merrimack would be apropos. He was young, and probably the muscle for the older gents, but, hey, it was an experience. What about Rev. John Wise? The Quaker experience? Salem madness? Lots of material and opportunity to relook at the American dream, as the times seem to indicate this as a necessity. The timeline would be only one of many categories. And, the stories would vary from the general view to the more academic. After all, we did mention Harvard which brings in Nathaniel Eaton from an entirely different view. How about looking at the early western movers? Some went by boat; others by land. Lots and lots of stuff happened, though the the actions of people, over the 400 years. Finally, we would get to the last 100 years and things like The Massachusetts Magazine, the complete cover up of the lost bodies (A new twist), and much more. 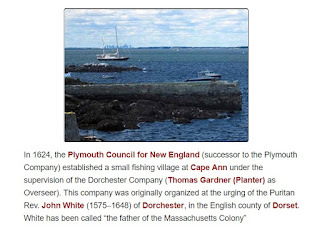 As suggested, there is no end to the growing necessity for history told in the views of people, families, groups, and others who do things and who do not just get other people to do things or just write (say Thomas Gardner versus John Winthrop - his son, fortunately, was a doer - Ipswich, et al). In the FB post at Gardner Research, I mentioned technology and having worked in the roll-your-own for many years (commercial rather than Open Source). We had to, as need always preceded the tool/system. Now, we have things being pushed out to which we are to adapt. This is brief. We'll be getting back to this theme, lots of times. This issue of Gardner's Beacon reviews the activities and accomplishments for the year as well as current and future research interests. The 400th of Plymouth is coming up in 2020. Cape Ann wouldn't be far behind. In terms of activities, this year, we learned more about Margaret Friar. The discussion was supported by her profile on WikiTree. We know her parents, when they got married, when she was baptized, her father's will, and notice of the marriage to Thomas. We completed a WikiTree profile for Dr. Frank, including his mother's line as delineated in his own handwriting. We found out that Dr. Frank is a descendant of both Margaret and Damaris. During the year, we did another print of The Gardner Annals. This issue includes Vol. III and IV. We summarize the contents of this recent print. Also, we now have a set of two prints (I&II and III&IV) available for purchase. Contact us at publications@TGSoc.org for ordering instructions. See Vol. VIII, No. 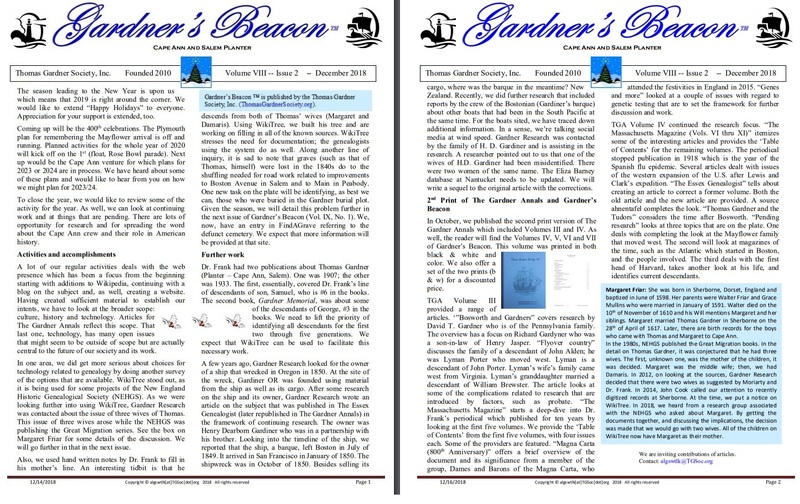 2 of Gardner's Beacon for a review of research to date and more. Sources. 02/28/2019 -- Updated the link for Sources. Yes, we have an interest in this, from a technology sense. I am talking both the biology (including anthropology et al) specifics as well the mathematics and computing (these last two are my special interest): DNA and genealogy, Admissibility. This fall, there was discussion that came out of Massachusetts that was interesting. I saw some discussion on Quora and have put it here as a place-holder. Let me just say this. We see collective abilities that have power, as in those related to names (families) or regions. We see categorization, as well. And, there is analytic power as we have seen with forensics. However, consider this. It is noted that our DNA differs by not much than that of some closer primates. Which suggests? We are not digging deep enough. That'll come. After all, the work at describing the genetic material is still relatively new. And, we know what that technology was all about. Too, I can show cases where doing this analysis did not help. Of course, one might argue that a full coverage of all people would be fairly strong. I am not so sure. Remember, all of this is either computational or is computationally driven. That whole realm, which is at the crux of our lives and growing in influence, is poorly understood despite all of the silly valley demonstrations of their prowess. Have you looked at the messes that those folks have us into now? Which may have been there before but are now several orders of magnitude more complicated?